I have a hard time finding in version 2.2.1 Modelio the BPMN notation instead I used in Modelio 1.2.2. In particular I am trying to model a new process with Modelio 2.2.1, but can not find events as StartMessage, startTimer, Interevent. Events in the palette I find only the symbols Start Event, Event Throw, Catch Event, End Event and Event Boundary, but can not find all the others. In addition there would be a guide for modeling the process with all the symbols of BPMN2? I'm not familiar with BPMN but you can find Start timer, Start Conditional, ... in the type dropdownlist from the Element view (Select a Start Event then select Type in Element view). I don't know interevent. Is it Intermediate event? In this case, an Intermediate event can be a Catch Event, a Boundary Event or a Throw Event. 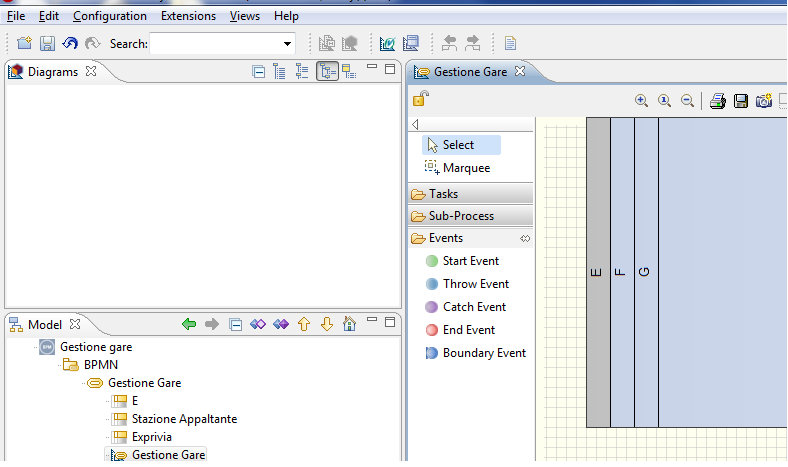 For example, select a Boundary Event then choose a type (Escalation or other one). Do you want a guide for modeling BPMN with Modelio or a general guide about BPMN? Last Edit: 6 years 5 days ago by pan. As far as I know we don't have a complete guide for modeling with BPMN in Modelio however we have a basic tutorial on Youtube . You should find the majority of BPMN elements from the diagram toolbar (on the left of a BPMN diagram). If you need to change the properties of the BPMN element, you can use the Element view. You should find all BPMN2.0 elements. 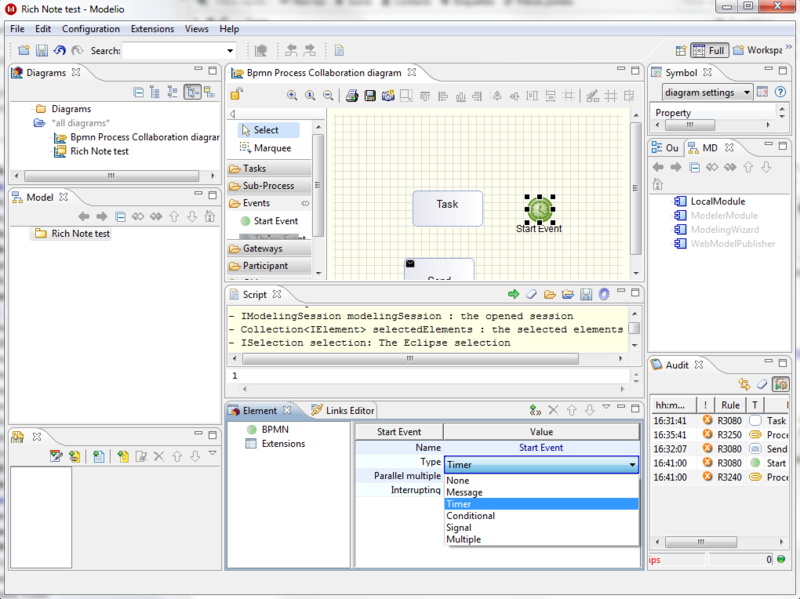 You can also work with the Model Explorer. Just right-click on an element, and select "Create an element", you will find all existing elements that can be created inside the selected element. Starting with the Model Explorer, you can create a "BPMN Behavior" and then you will be in a BPMN context so you will not see UML elements in the "Create an element" submenu. You can create two kinds of BPMN diagrams: "BPMN Process Collaboration diagram" and "BPMN Sub-Process diagram". The "BPMN Sub-Process diagram" can only be created on a "Sub-Process" element. From there, I think you can easily modeling with BPMN. If you are blocked or if you have any question, do not hesitate to post in the forum we will be glad to help you.